Digital image enhancement provides a vast array of choices for improving the visual quality of diagnostic images. The appropriate choice of such techniques has a great impact on imaging modality, task at hand and viewing condition. In clinical diagnosis, such techniques include image enhancement and analysis along with visualisation. In response to unique demands in medical/dental imaging, several innovative imaging methods have been, and are being developed for the first time. The adoption and innovation of these processes constantly offer researchers and medical practitioners a new approach for diagnostic imaging. 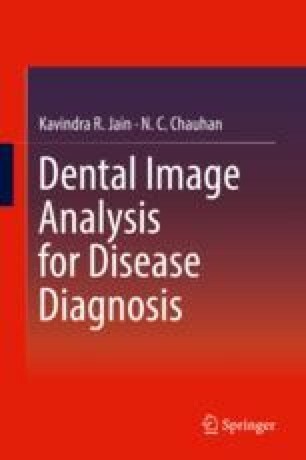 This chapter demonstrates the use of basic morphological operations and edge detection methods for preprocessing and segmentation of dental radiographs. The results produced are compared with a set of ground truth images. The process carried out was manual in nature, and the grey level clipping varied from image to image. Moreover, the cropping being done to extract the tooth was manual in nature and the later comparison with the ground tooth to finalise under which case the cyst falls was also manual. The identifications from the methods may be correlated with the clinical findings of the practitioners in order to proceed with further treatment.